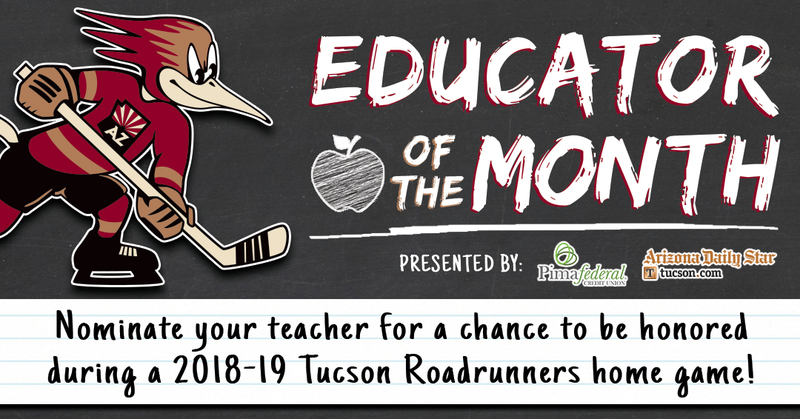 TUCSON, AZ – The Tucson Roadrunners, proud American Hockey League affiliate of the Arizona Coyotes, announced today that the club will honor a local “Educator of the Month” in conjunction with Pima Federal Credit Union and the Arizona Daily Star over the remaining months of the 2018-19 season. Starting in the month of November, one local teacher will receive $1,000 in school supplies as well as four (4) tickets and recognition at an upcoming Roadrunners game. The recipient will also be featured in the Arizona Daily Star for their efforts. Both parents and students can submit their nomination for an educator from his/her school HERE. For more information on the program or the Tucson Roadrunners, call 866-774-6253 or visit the team’s offices at 175 W. Broadway Blvd. The Roadrunners head to California this weekend with games against the Ontario Reign and I-8 Border Rival San Diego Gulls on Friday and Saturday. Currently located at second place in the Pacific Division with a record of 4-1-0-1. Forward Adam Helewka ranks tied-fourth in the entire AHL with five goals in six games and goaltender Adin Hill has won all three of his starts thus far this season. Both games can be seen live starting at 7 p.m. at Brother John’s Beer, Bourbon & BBQ, the official home for all Tucson Roadrunners watch parties. One lucky attendee will win dinner for two and another will receive a pair of ticket to an upcoming Roadrunners home game. All regular and postseason games can also be heard live on Fox Sports 1450 AM, foxsports1450.iheart.com and the iHeart Radio app with the “Voice of the Roadrunners” Adrian Denny. To watch each came from the comfort of your home, head to the all new website of AHLTV, theahl.com/AHLTV.